CD Rippers. Download Free CD Ripper. What is a CD Ripper? Community Technology Software CD Rippers. Download Free CD Ripper. What is a CD Ripper? A CD ripper is special software that creates amazing opportunities for listening to music. Through the use of CD ripper software, a person can use audio CD tracks to create audio files on the computer. The newly created audio tracks can be saved as MP3, WAV, OGG, or WMA audio files. “Ripping” is the term used to describe this process. More recently, further advanced CD ripper software has become available. This software allows the user to convert back and forth between multiple formats. Some CD ripper software is now available to record vinyl LP’s and cassettes. With CD ripper software, these musical formats can be created in MP3, WAV, OGG, or WMA audio files. Where Can CD Rippers Be Found? Many different versions of CD ripper software are available online. A search for “CD ripper” on the Internet will bring up a slew of CD ripper software available for download. The majority of CD ripper software is very user friendly. In addition, most offer an array of options. Nonetheless, the consumer should do some searching and comparing before determining which CD ripper software is best. What is Important in a CD Ripper? 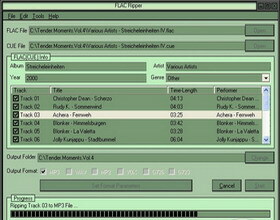 Each CD ripper software program has its own style and its own unique interface. It is important for the consumer to choose a program that is both easy to use and to understand. The capabilities of the software are irrelevant if the consumer is unable to use it properly. It is also necessary to look into the software’s editing abilities when comparing CD ripper software options. Most CD ripper software programs allow the user to select the output format for the music. This output can include the bitrate, channels, and frequency. The versions of CD ripper software, however, are able to create high quality files that digitally match the original audio bit for bit. Top-notch CD ripper software also creates tags using metadata that is encoded in audio files. The metadata has information regarding the artist, song title, track number, and album title. This information is automatically input into the MP3, WAV, OGG, or WMA audio file. Some CD ripper software programs also search the Internet for images of album covers and then create a thumbnail image of the cover next to the file. Some CD ripper software programs are also able to remove the silence that is sometimes at the beginning or end of tracks. Still other CD ripper software programs permit the user to edit the songs, which gives the user full control of the sound quality of the MP3, WAV, OGG, or WMA audio file. A CD ripper can also be used to select favorite songs from a CD in order to create a mixed CD. Some CD rippers even allow the user to rip audio tracks from CD’s and burn them directly to a new CD without saving them as a new audio file on the computer. Countless people are ripping CD’s every day. This advancement in technology is certainly the way of the future and a great tool for music lovers of all genres and ages.